There’s something about rosewater that lends an exotic air to every recipe it touches. Conjuring up images of desert oases and Middle Eastern fairytales, this unique flavoring delights with its fragrance and flavor. 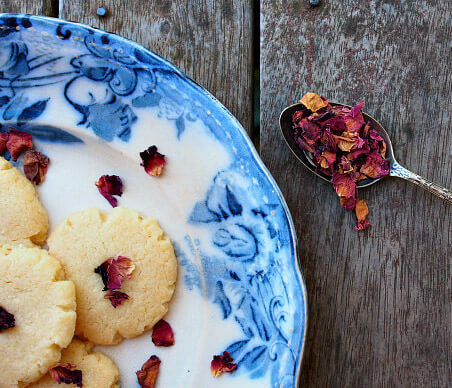 Rosewater shortbread cookies are a beautiful and delicious way to showcase this unique flavoring. The tender, buttery crumb is an ideal showcase for delicate and fragrant rosewater. 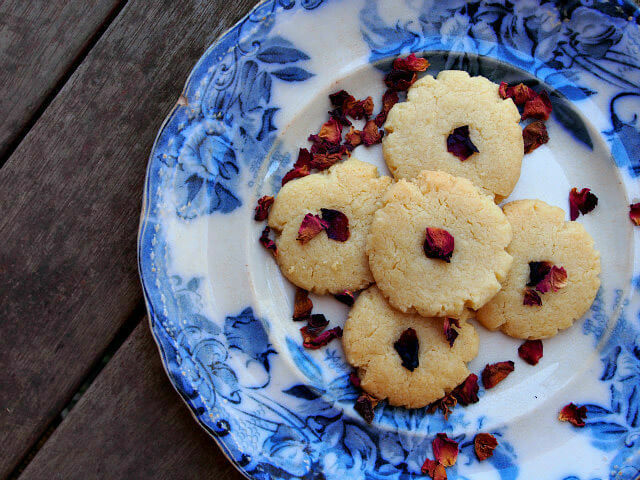 With their luscious, flowery fragrance, rosewater shortbread cookies are a true celebration of spring, a delicious harbinger of bright, sunny days when the grass is green and flowers are in bloom. One nibble of these beauties and you’ll be whisked away from snow and ice and frigid winds to spring afternoons of warm breezes and glorious sunshine. Shortbread is such a delightful cookie. It is simple and comforting, a cookie that pairs beautifully with a variety of flavorings. Rosewater is a lovely addition, for its delicate rose fragrance tantalizes the senses even before the first bite — making this the perfect teatime treat to serve with some Portland Rose City Chai. Shortbread can be made with margarine or shortening, but for true shortbread flavor, real butter is essential. The color of the butter infuses a richness to the dough, transforming it from insipid white to golden deliciousness, and the flavor cannot be beat. 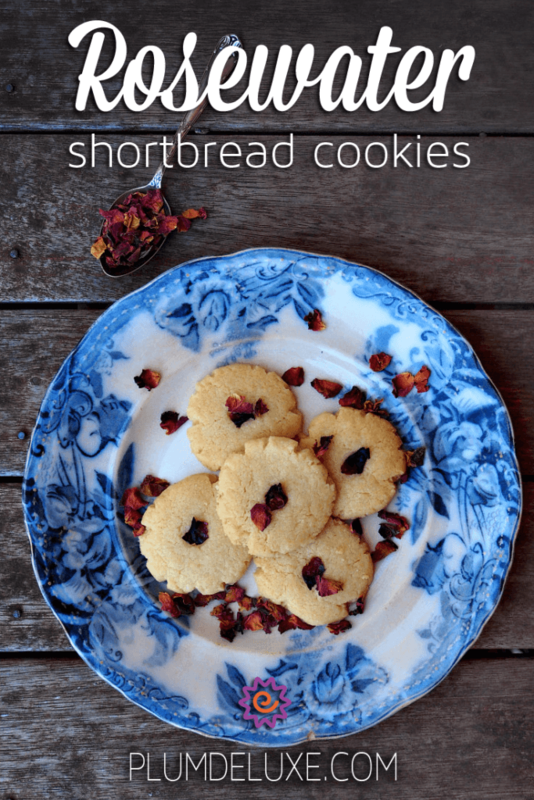 You can also use cold coconut oil to make shortbread, but for this recipe, I find that the coconut oil overwhelms the taste and fragrance of the rosewater, so I’d stick to butter. Most shortbread recipes require cutting in butter, but I like to make my shortbread with melted butter. Not only is this easier, but the recipe takes all of 5 minutes to make and it results in a cookie that is crisp and buttery and holds its shape beautifully. Rosewater may seem like an exotic ingredient, but it is simple to find in many grocery stores and Middle Eastern shops. If you don’t have access to a store that carries it, you can also order it online, or make your own substitute. Making homemade rosewater is quick and easy. Simply collect about 1 cup of organic rose petals. You don’t want any nasties in your rosewater, so make sure the petals you collect are pesticide-free. Rinse the petals under cool water (if fresh; ignore this step if using dried rose petals), then place in a stainless steel pot and pour in enough distilled water to cover. Turn the heat to medium, and bring to a simmer. Cover the pot and simmer for 20-30 minutes until the petals have lost their color. Remove from heat and let cool to room temperature. Strain the mixture, discard the rose petals or toss onto your compost pile, and pour the liquid into a sterilized glass bottle. Seal and store in your cupboard or fridge until ready to use. Once your rosewater shortbread cookies are baked and cooled, you can eat them straight away as is, or take a moment to decorate them. You can amp up the rosewater content by making a quick rosewater glaze or thick buttery icing, or keep things simple and elegant by scattering edible dried rose petals over the platter. In a medium bowl, stir together flour, sugar, and salt. In a small cup, stir together melted butter and rosewater, then pour over flour mixture and stir until incorporated. Using a teaspoon, scoop out mounds of dough, roll into small balls, and place on baking sheet lined with baking paper. Using bottom of glass, press each ball into a circle about 1/2 inch thick. Top with a rose petal. Bake cookies for 10-15 minutes just until they start to brown. Serve warm or room temperature scattered with a few more rose petals. Want more florals? Check out these tips and recipes for baking and cooking with edible flowers.